Before I get started on telling you about these beautiful products, I want to tell you that that the creators behind the scenes are Husband and Wife, that in itself is truly special. Wanting to pursue a healthier lifestyle they decided to create natural products that they could use at home as well as sharing with the world, the love they have for each other and their company really does show in their products. 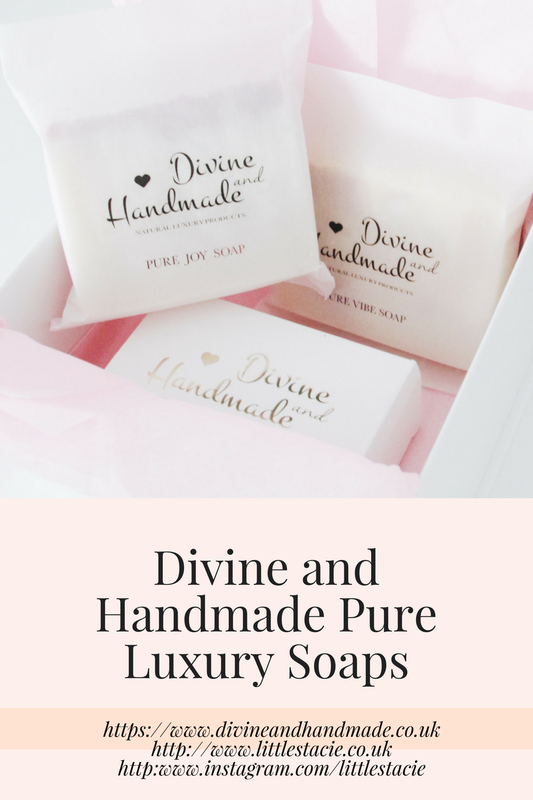 For most people who have followed my blog/instagram for some time, will know that I am obsessed with soaps and various beauty/skincare products, so when approached by Divine and Handmade Luxury Soaps I was very keen to sample their products. Over the years I have tried various brands of soaps as I have fairly sensitive skin, so I avoid soaps that are heavily fragranced, however some companies lure you in, and when it comes to using the soaps they don't live up to expectations. These soaps certainly didn't disappoint and I want to emphasise on the words Divine and Luxury. Firstly, the gift box is so simple and elegant, the design is pure white with the company logo printed in a beautiful gold classy font. At the front there is a little magnet holding the lid down, a small little touch that I love on gift boxes, it really shows extra care has been put into making them and it helps towards holding the products securely. Inside the box, the soaps were wrapped in pink tissue paper, adding to the presentation along with a little card with the companies name on it, as you unwrap the tissue paper, the room fills with a beautiful smell. My gift box contained 2 Pure Luxury Soaps and 1 Sugar Scrub, again the packaging is beautiful that it took me a while to bring myself to open them! I love this soap for it's amazing properties and how gentle it is on the skin, I'm now using this as a cleanser as it's really good at removing make up and leaving the skin feeling clean and soft with no irritation. The soap is unscented and contains Avocado Oil which is an Anti-Oxidant and great source of Minerals and Vitamins for your skin and Coconut Oil, Anti-Bacterial and Anti-Fungal, you really can't ask for much more! Pure Vibe follows with more great ingredients, its made up of 70% Vegetable Oils making it extremely rich in Vitamin E, helping protect against radical damage such as pollution which can cause premature ageing. Grape Seed Oil helps to treat acne, tighten the skin, reduce dark circles around the eyes and scars as well as restoring collagen. Coconut and Avocado Oil are used again in this soap adding Anti-Bacterial and Anti-Fugal to the list of great things this Soap will do for you. The soaps even have the logo imprinted, it's the little things that make a product special. This is where the most divine smell from the box comes from, floral smells instantly make me feel uplifted and that is exactly what I get from the Scrub, it gives you the feeling you get when you walk into a spa. This scrub contains Pure Cocoa Butter giving you ultimate moisture and is fantastic for dry skin followed by Lavender Oil, known for it's healing properties it can help heal burns and wounds as well as being full of anti-oxidants and improve eczema and psoriasis. It also helps relieve anxiety and stress and helps improve sleeping. Ylang Ylang has Anti-Microbial properties, reducing skin irritation and redness, and the smell is incredible uplifting. This Sugar Scrub is beyond perfect for me and I honestly couldn't want more from it, expect an endless supply! No Animal Fats, Artificial Fragrances, Colours or Preservatives are used in this soap, only fine natural ingredients making it very gentle for your skin. Palm Oil is used, however, it is FAIRTRADE and the company are working on Palm Oil free products. Whether it's for yourself or someone special, I couldn't recommend this brand more and I'm so excited to see their future products, they aren't just soaps, but very beneficial for your daily skincare needs, I even use them on my son. If you subscribe to their newsletter on their website, you will receive 20% off your first order, they are also currently hosting a giveaway which I have linked below.